Thanksgiving is over and everyone around me is in full blown Christmas mode. I'm just not there yet. It's possible that I'm still suffering from turkey hangover or just that I need some time to transition from one holiday to another. The thing about Christmas is that it starts pretty much after Thanksgiving even though it's a month away. Everyone is getting their tree, decorating and getting into the spirit of it all. I find the transition to be abrupt so I allow myself to be in this disparate mood rather than forcing it to feel a certain way. Every year I go through this slight resistance but this year even more so. I try to go about my day as usual, running errands, this and that and a trip to the farmers market. I hit my usual stands - one of them being the bread stand where I get two loaves for my kids. So I stand in line, my daughter in her stroller, waiting my turn, only to find that the credit card machine is acting up. The young girl embarrassed about the hold up quickly goes to find the owner. No big deal as I wasn't in a rush and I stand aside to wait. The thing that happened next floored me. The woman behind me bought my bread. After refusing several times, telling her that I can wait for the owner and assuring her that she doesn't have to, she said: "I want to, it's Christmas". I tried hard to contain my tears but they did not cooperate. I wanted to hug her as her gesture of kindness touched me deeply but thought I may really lose it and cause a scene. I thanked her about 10 times and walked away truly shaken by the experience. It was $5.98 but it was kind and moved me. And in that moment it became clear, the holiday season to me isn't about trees, presents, about all what TV commercials want you to believe it should be. It's about humans being decent to one another. Complete strangers showing kindness without expectation. This little episode gave me pause and reminded me why I do like this time of year. Perhaps artificially induced in some ways, but people are more caring and our usual selfish tendencies are put on hold. And why do I bring up this story? Because this year, I hope to surround myself with the people I love and pay this kindness forward in a way. Nothing makes me happier than being able to feed people. Cooking for others is something I get from my mother and want to share it with friends and family as much as possible. 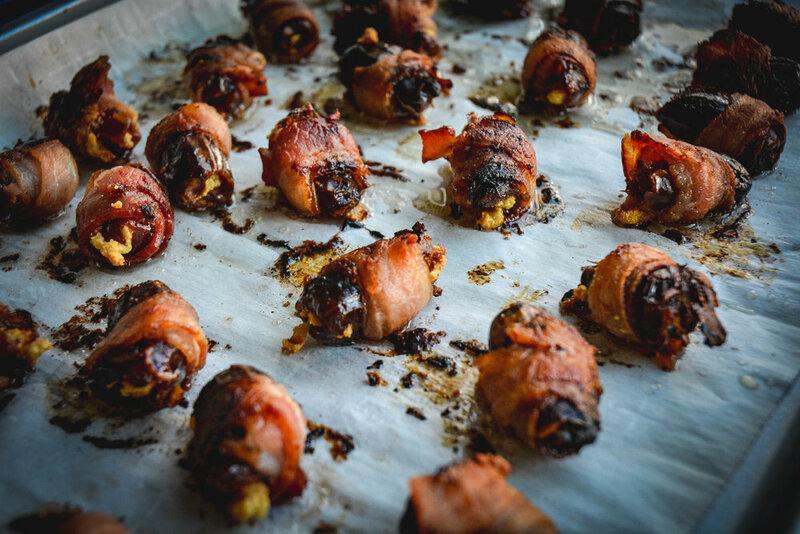 One appetizer I toyed around with that's perfect for entertaining, is a bacon wrapped dates stuffed with cashew cheese recipe. These things are dangerously good. Salty, sweet, creamy and they can be served hot or cold. They also keep well in the refrigerator and can be made ahead of time. You can play around with the quantity as you see fit. Basically what you need is one 1/4 slice of bacon per date and a little scoop of cashew cheese. You'll have plenty of cashew cheese left over so if you plan on making this for a big group, you'll have enough. You can also refrigerate the rest of the cashew cheese and use it wihtin a week. *If you can't find nutritional yeast, you can skip it but it does adds a "cheese like" taste to the mixture. Soak cashews for at least 2 hours prior to starting. Pour enough hot water over cashews to submerge. In a food processor, combine nutritional yeast, cashews, lemon, salt, garlic powder, mustard and water. Combine until fully incorporated and creamy. Set aside. Preheat oven to 375 degrees and line baking sheet with parchment paper. Slice bacon lengthwise and then in half so you have 4 even thin strips. Next, make a small incision in dates so you can stuff them with cashew cheese. Use about a 1/4-1/2 tsp per date. Fill each of them and roll with bacon. You can use a toothpick to secure the bacon in place by sticking the toothpick right through the date and bacon. Place on parchment lined baking sheet and bake for 13 minutes. Remove from oven, take out toothpicks and turn dates over and bake for another 12 minutes. When finished, allow to cool and serve warm, at room temperature or refrigerate for 24 hours.